Well, thank goodness for that, because this kind of writing is all too often filled with “clichés like that.” These stories aren’t. Instead, they’re filled with warmth and honesty, and quite often, humor. “The Prom Date” by Walter Dean Myers: a guy runs a lottery to get a date to his junior prom, and gets more—and less—than he expected. “Jump Away” by René Saldaña, Jr.: a guy explores the true nature of courage. “Shockers” by David Lubar: a guy gets dragged to a boy-band concert by his girlfriend (definitely not a good sign). This was one of my favorites, as well. “Pig Lessons” by Edward Averett: A guys learns lessons about life when his grandmother makes him care for a baby pig. “Strange Powers” by Craig Thompson: A graphic story in which a guy learns about strange powers, both his own and those of girls. “Princes” by David Levithan: A guy finds out how brave and strong his little brother really is. “Fear” by Terry Trueman: A guy stands up to bullies, and to his own fear. What I love about this book is that it reveals just how complicated being a guy can be. When I think about myself at the age the guys in these stories are, life seems pretty simple: we eat (always too much), we sleep, we go to the toilet, we read (never enough! ), we read on the toilet (this habit starts early), we fart, we shower (never enough for older sisters, though). And yet, despite our awkward, smelly otherworldliness, we are still human. Tickle us, and we laugh. Prick us, and we bleed. It is too easy as an adult to look back at our teen years and see only the good things, mythologizing those years as our “glory days” while forgetting how complicated we and our lives really were. The strength of this collection is these are writers who can look back without creating myths, who can look back and show us laughing and bleeding. The voices are authentic, the experiences related genuine. If there’s a weakness, it’s that there isn’t much here that addresses multicultural issues. Walter Dean Myers deals openly and honestly with the intricacies of an interracial date, and David Levithan does likewise with the intricacies of being both gay and Jewish (now there’s a combination you don’t see represented very often), but there’s nothing that’s distincively Asian-American or American Indian. (Sherman Alexie, where are you?) And while René Saldaña, Jr. is Latino, his story, “Jump Away,” isn’t necessarily written from a Latino character’s point of view, although it is an engaging story nonetheless. But seriously, my only real disappointments with this book is that I didn’t discover it sooner, and that it was over all too soon. And that in itself is a high recommendation for a book. Age: intermediate to YA. Recommendation: A must read. Mercado, Nancy E., ed. 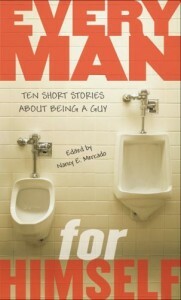 Every Man for Himself: Ten Short Stories About Being a Guy. New York: Dial-Penguin, 2005. Because this is an anthology of short stories, it has lots of tags. Enjoy! Sounds like a great read. I had the experience of a father who taught me that life is every man for himself. It never mattered what I said or did, he would always do exactly what he thought was required with no regard to any outside input. I basically didn’t matter.